Tyrosine is a natural amino acid which is needed for the “synthesis of proteins, catecholamines, melanin pigment, and thyroid hormones. Tyrosine also provides energy when catabolized through parahydroxyphenyl pyruvate to fumarate and acetoacetate” . Tyrosine is used to make critical hormones by both the thyroid and adrenal glands , thus helps the body deal with stress. Tyrosine is incorporadoted into all proteins . While most tyrosine-containing supplements only contain isolated L-tyrosine, Vegetarian Tyrosine also contains all the supporting amino acids naturally found in winged beans (Psophocarpus tetragonolobus). Vegetarian Tyrosine contains no animal derivatives and is strictly vegetarian as it is a 100% bean and fermented plant extract supplied in a vegetarian capsule. Tyrosine may reduce the net rate of protein breakdown in the body and appears to help with endurance . Tyrosine has an effect on nerve impulse transmission and may “improve vigilance and lessen anxiety” . Gary Null (Ph.D.) considers tyrosine to be a therapeutic amino acid for depression as well was an antiencephalopathic, antiparkinsonian, and antidepressant . Women on oral contraceptives have been found to have less plasma and brain levels of tyrosine which results in a reduction in catecholamines, which affect mood. . Oral consumption of tyrosine has, in some case, been shown to completely alleviate depression while increasing plasma tyrosine levels [8,9]. It has also been shown to help when MAO inhibitors did not . In rat models vitamin C has enhanced the ability of tyrosine to decrease blood pressure [10,11]. Interestingly, “Tyrosine has been known to normalize blood pressure whether high or low. Tyrosine is being tested by the Air Force to enhance performance under stress” . The body naturally produces tyrosine by converting it from phenylalanine . “Compared with tyrosine which has a de novo synthesis component limited by phenylalanine oxidation, most nonessential amino acids have a very large de novo synthesis components because of the metabolic pathways they are involved in” . This might explain why taking separate tyrosine is more helpful for many than taking other separate amino acids classified as nonessential—they can be made with much easier (with less restriction) than tyrosine can (tyrosine requires liver hydroxylation). Vegetraian Tyrosine Supports the Adrenal Glands. Tyrosine “produces the neurotransmitter molecules dopamine, norepinephrine, and epinephrine” . Epinephrine and norepinephrine are both involved in stress response. A Parkinson’s study found “l-tyrosine administration significantly increased cerebrospinal fluid (CSF) tyrosine levels in both groups of patients and significantly increased homovanillic acid levels in the group of patients pretreated with probenecid. These data suggest that l-tyrosine administration can increase dopamine turnover in patients with disorders in which physicians want to enhance dopaminergic neurotransmission” . Oral tyrosine feeding has been found to significantly decrease both free and conjugated plasma norepinephrine concentrations, thus appears to be helpful for people with conditions associated with excessive sympathetic nervous system activity, including hypertension . This may also explain why tyrosine helps many with anxiety. Interestingly, supplemental tyrosine appears to increase norepinephrine when it is low  and increase it when it is too high . Adrenal gland support may be one of the reasons that there are reports of increased energy and endurance from those taking tyrosine [4,6]. 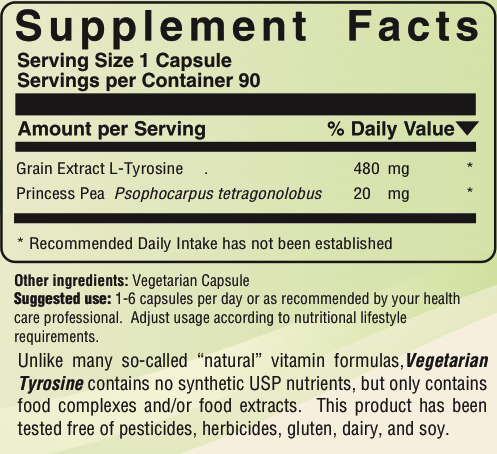 Vegetarian Tyrosine Supports the Thyroid Gland. Hypothyroidism can be associated with low levels of tyrosine . This is totally logical as the primary thyroid hormone (T1) is called monoiodotyrosine (iodine and tyrosine) . The body converts this primary hormone from T1 to T2 (diiodotyrosine) to T3 to T4 and back to T3—but it all starts with tyrosine attaching to iodine . Some naturopaths have reported success using L-tyrosine to help nutritionally support the thyroid gland [6,20]. Symptoms associated with hypothyroidism include poor metabolism, fatigue, weight problems, depression, mood swings, mental or physical slowness, temperature intolerance, dry skin, menstrual complaints, and low libido [20,21]; most with hypothyroidism do not show all the symptoms associated with it . Restricting Tyrosine is Harmful for Most. Recent human research has found those with less tyrosine “became less content and more apathetic ” and “demonstrated a sad latency bias ”, thus otherwise normal people deprived of tyrosine seem to show symptoms “characteristic of clinical depression” . Another human study found that by restricting phenylalanine and tyrosine, “All patients experienced problems and side-effects and increases in anxiety and depression” . Another stated, “All six subjects had low or deficient blood concentrations of both tyrosine and tryptophan, which are precursors for dopamine and serotonin” yet when neutral amino acids were added, “At the end of the study all patients reported increased energy and overall improvement in well-being” . An all female study found that mood and energy worsened when tyrosine and its precursor were highly restricted . Some inherited conditions can interfere with tyrosine [1,11,21]. Yet for some other inherited disorders (such as children with phenylketonuria), the consumption of tyrosine is essential [1,11] (though some suggest getting it less concentrated may be a preferred method ). Note: People on MAO inhibitors (a family of now generally lessor used antidepressant medications as well as Deprenyl) or with conditions such as tyrosinemia [11,21] or otherwise contradicted should not take Vegetarian Tyrosine. Vegetarian Tyrosine naturally contains carbohydrates, lipids, proteins (including essential amino acids), as found in Winged Beans Psophocarpus tetragonolobus--all the nutrients shown above are contained in beans or a fermented bean extract. Unlike many so-called “natural” formulas, Bean Tyrosine is only comprised of foods and contains no synthetic USP nutrients or isolated mineral salts, but only contains foods and food extracts. Goldberg IK. L-Tyrosine in Depression. Lancet, August 16, 1980:364.